Imagine if crop yields across the United States dropped more than 50 percent in a single year. It’s difficult to fathom just how catastrophic this would be—but that’s exactly what’s happening in Ethiopia right now, thanks to a deadly, El Niño-fueled drought. The effects of this year’s El Niño—which may go down as the strongest on record—vary from region to the region, as warm ocean waters in the equatorial Pacific disrupt ocean and atmospheric circulation patterns worldwide. In the US, we’ve seen torrential rainstorms, flooding, and blizzards, but other parts of the world are desiccating. Case in point: Ethiopia. A country known for horrific famines, Ethiopia is now on the brink of watching history repeat itself, as a widespread drought is causing crops to wither and rivers dry up. Experts say it’s the worst dry spell Ethiopia has seen in thirty years. A full 80 percent of Ethiopians are subsistence farmers or livestock herders. Most of them irrigate their crops with nothing but the rain, which falls hardest between June and September. Now, a year of weak rains, followed by strong El Niño conditions since October, is causing devastating crop failures—a 50 to 90 percent decline in yields across the country, according to the United Nations. Aid organizations and news outlets are describing a desperate situation: men and women walking several days to find water, or sharing humanitarian aid supplies with their livestock. “They’re being forced to make these hard choices: do they and their families drink, or do they share water with their animals to keep them alive?” Shannon Scribner, the Humanitarian Policy Manager for Oxfam, told Gizmodo. And if more aid is not forthcoming soon, a widespread famine could ensue. 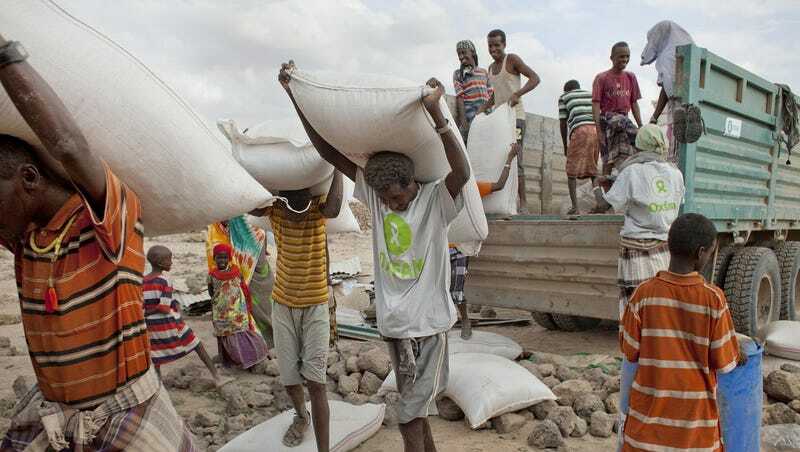 While the safety net for Ethiopian farmers is much stronger than it was thirty years ago due to new food security programs, the government still estimates that 10.2 million people will need food and other resources this year, totaling $1.4 billion of aid. So far, less than half of that sum has been raised. Ethiopia isn’t the only country suffering from a severe lack of rain. Millions of people across Guatemala, Honduras, El Salvador, and Nicaragua are also in need of food aid, as their countries struggle with El Niño-fueled droughts. Meanwhile, Australia and Indonesia are experiencing record-breaking fire seasons, with blazes fueled by months of exceptionally dry conditions. With El Niño now on the downswing, will the drought in Ethiopia start to abate? According to Scribner, “belg” rains—which comprise the shorter of Ethiopia’s two rainy seasons—should begin falling this month, offering some relief to drought-stricken farms. Still, even in the best case scenario, it’ll be months before the food crisis is over.